Judging from the popular message boards such as The Grad Café and So You Want to Go to Grad School, which Arnold’s already covered, this is the time of year when people either get accepted or rejected for grad school. You’re not alone: Aspiring professors are finding out if they got postdocs and tenure-track jobs, too. Do not be dejected. Don’t take it personally if you get rejected for a tenure-track job, grad school or a postdoc. This is one case in which you can rest assured that it’s not you … it’s them. Thanks to this wretched economy, more people are applying for a dwindling number of slots, and some programs are dropping fellowship funding altogether. If you were rejected in the early stages of all your applications, then maybe you should tweak those applications for another round. But if you are sure that you made it to the later stages and didn’t break through, don’t fret about your talent or give up altogether. Try again next year if it is your true passion, or keep looking for your true passion. By the time you are a finalist for the job, much of the decision is out of your hands. There are so few slots that, even if you have excellent scores and recommendations, your victory will be a matter of taste. It may also be a matter of office politics, which you cannot escape in academia. (In fact, office politics may be worse in academia, but that’s another matter for discussion …) Keep your skill sets sharp, apply again, and don’t close your eyes to other opportunities. 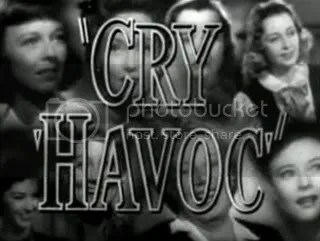 Image from Wikimedia Commons, screenshot of movie “Cry Havoc” from public domain.